Dairy Queen announced today it is getting into the coffee business. The company is launching iced coffee beverages and frappes. This is the first time the company has offered coffee beverages across the U.S. The iced coffee beverage is available in Vanilla, Salted Caramel or Mocha flavors. The Ultimate Frappes are available in Oreo, Caramel Chip and Midnight Mocha. The iced coffee costs $1 and the frappes are $2 weekdays between 2 to 5 p.m.
Barry Westrum, executive vice president of Marketing for Dairy Queen, says in the announcement, "This is our biggest beverage launch ever and happy hour is a very competitive day-part across all restaurant brands. We've really differentiated ourselves from other QSR and beverage competitor happy hour programs by creating a stir in our space with variety, value and taste. Our fans want something different and better and at our DQ locations they can now treat themselves to the unbelievable every day. 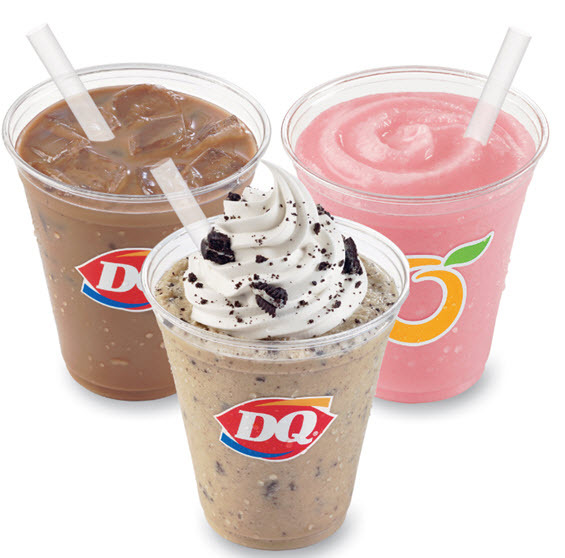 With our Hardest Working Happy Hour, fans will find quality, portable iced coffee DQ Ultimate Frappés and smoothie beverages at a great price and offered in a uniquely DQ way. It's an extra indulgence during the day that's perfect as an afternoon on-the-go pick-me-up." USA Today says Dairy Queen is taking aim at Starbucks and McDonald's with its new beverages. Chains like Krispy Kreme and Dunkin' Donuts also offer coffee drinks.